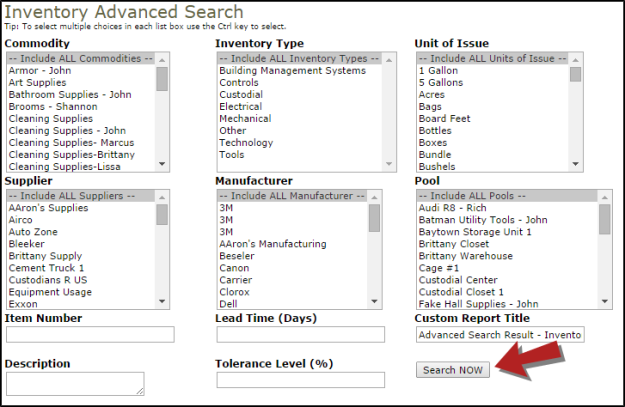 The Advanced Search feature gives you a way to search for Inventory, Transactions, and Requests. It is one of the quickest and easiest ways to start generating reports. Advanced Searches return any results that match your selected criteria. Those results can be printed as a PDF document or as an Excel spreadsheet. The Advanced Search defaults to the Inventory Search. To search for Transactions or Requests, click on the appropriate link in the Advanced Search Shortcuts section at the home of the page. On the Advanced Search page, you will see the possible filter selections. (Commodity, Inventory Type, Supplier, etc.) You can select any combination of items from each of the fields. You can also select multiple items from within some of the fields by holding down the CTRL key on your keyboard. The more items that are selected, the more specific your search will be. *Note: When selecting multiple items from a criteria box, the "Include All" option should not be highlighted. Click the Search Now button to the right of the search filters. Your results will display on the screen and you will have to ability to print this page to PDF or Excel by using the icons at the bottom left of the list.